Hey guys! 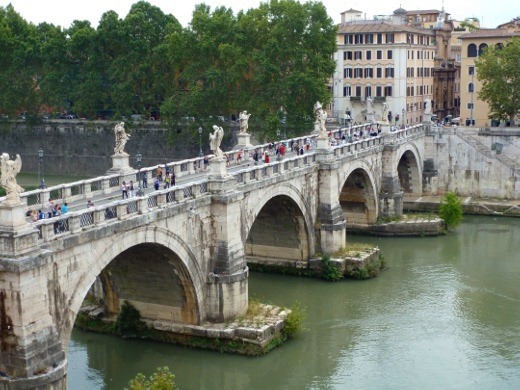 I have just a couple days of my Europe trip left to tell you about, and today I will recap our twelfth day in Europe, and our second full day in Rome. 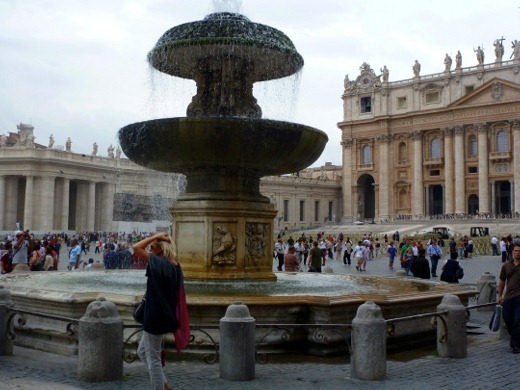 After eating free breakfast at our hotel, we took the metro from Termini to the Ottaviano-San Pietro stop, which was only about a five minute walk to the Vatican. 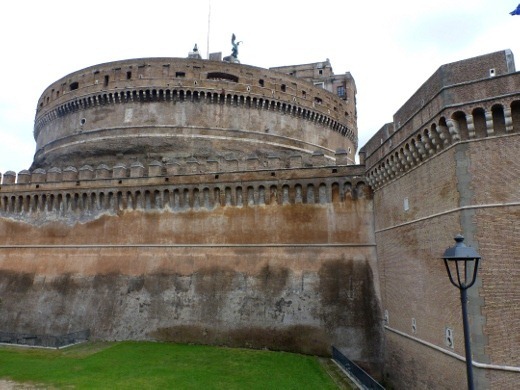 We made an advance reservation for the Vatican Museums online before we left, and simply showed our prepaid vouchers to the guards and bypassed the whole long line down the block! I totally recommend making reservations in advance if at all possible. We were also early for our 9:00 AM reservation and were still granted admission when we arrived at around 8:40 AM. 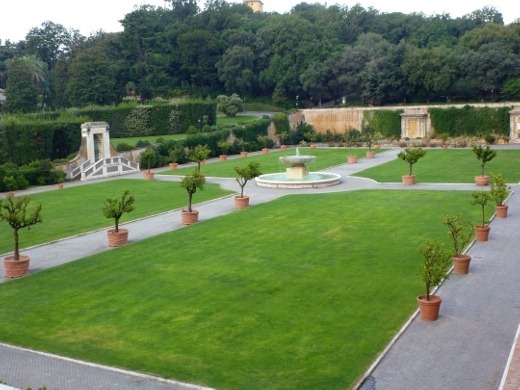 Grounds in the Vatican as seen from the Vatican Museums. We somehow arrived early, made our way past the tour groups, and seemed to have the place to ourselves for much of our time at the museums! 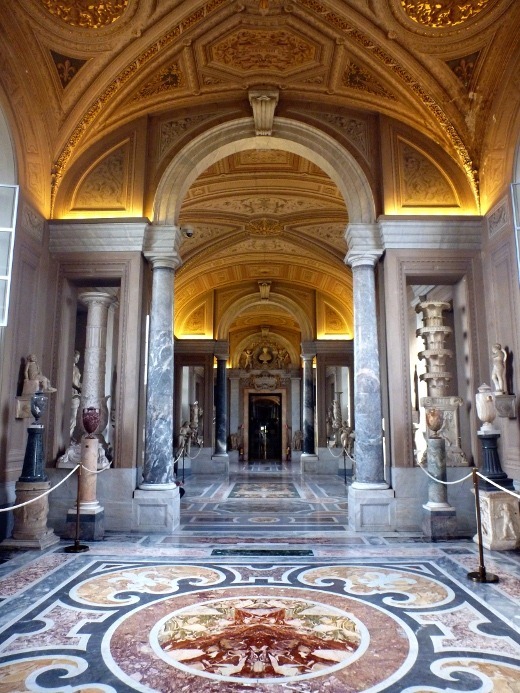 I did not take many pictures in the Vatican Museums, but I will tell you that the museums were rich, giant repositories of beautiful artwork. And of course, while visiting the Vatican, we did see the Sistine Chapel, with Michelangelo’s famous ceiling that took four years to paint. 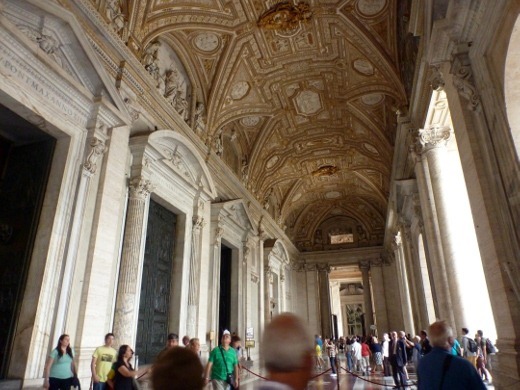 I’ll admit – the Sistine Chapel was smaller and completely different than I expected. No pictures of the 500+ year old artwork were allowed, but we sat ourselves down and stared in awe at the ceiling for a solid 20 minutes. Seeing the The Creation of Adam was incredible! I’ll admit… I was somewhat naïve and wasn’t even aware that The Creation of Adam was located on the ceiling of the Sistine Chapel, and when I spotted it, I was rather awestruck. 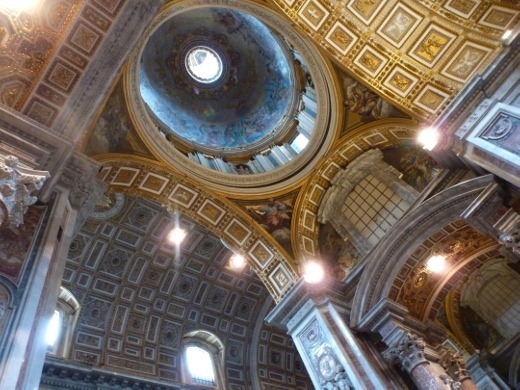 However, the ceiling of another room in the Vatican left me less than awestruck. In fact, I think this single piece of artwork, this ceiling, elicited more of an emotional reaction from me than anything else we saw in Rome. 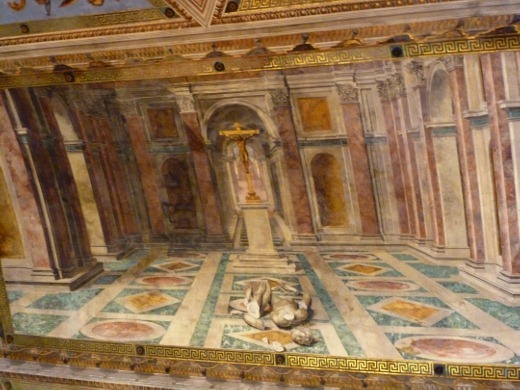 This ceiling depicted a statue of a Roman god, discarded, crumbled upon the floor (of the Pantheon, it appears), and replaced with a Christian crucifix. 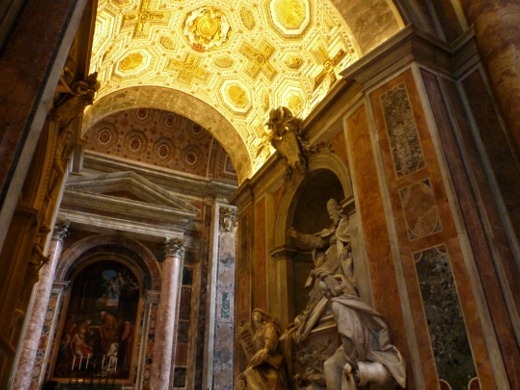 Granted, Vatican City is the center of the Roman Catholic Church and they can put what they want in their museums, but as someone who is not Catholic, this supremely offended me. Like, I kind of wanted to vomit on the floor. I could go on and on about how wrong this is to me but I shall refrain and spare you, dear reader. 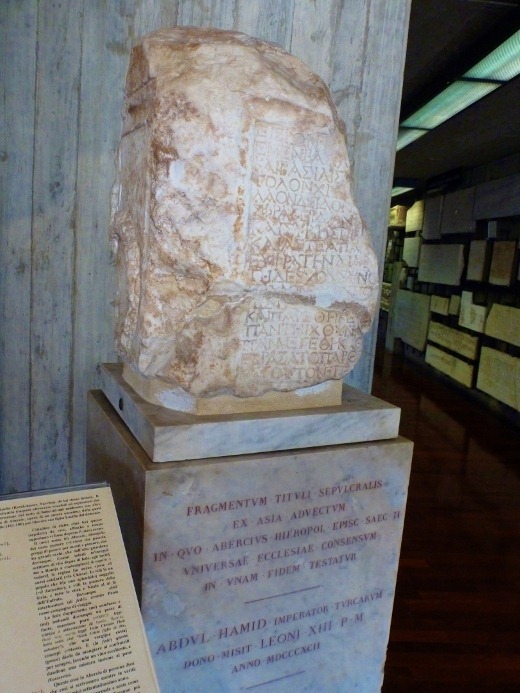 We also saw the earliest Christian inscription ever discovered in the world, according to a tour guide we overheard speaking to a group. 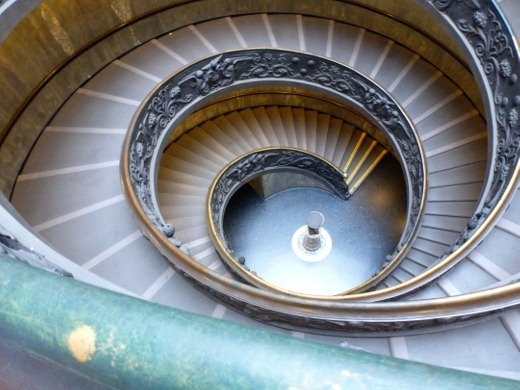 All in all, the Vatican museums are a magnificent repository of art work, and though I am not an adherent of the religion, I came to see the history and the art. 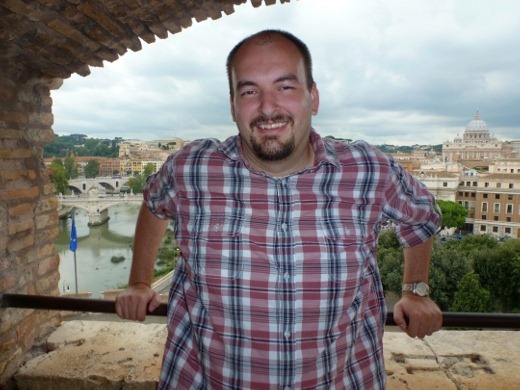 Honestly it just didn’t do as much for me as I thought it might, but I’m still fortunate I was able to visit the Vatican and have the experience. 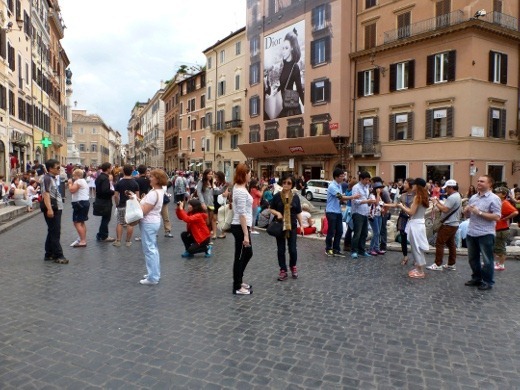 We saw lots of tourists mailing letters from the Vatican, and taking pictures of themselves while doing so. 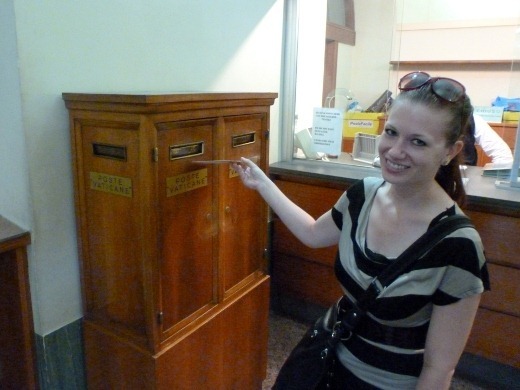 I didn’t even know this was “a thing” until then, so clearly I had to partake in mailing a postcard from the smallest independent state in the world. Me, feigning enthusiasm. Then we left the museums down these peculiar ramp-stairs. 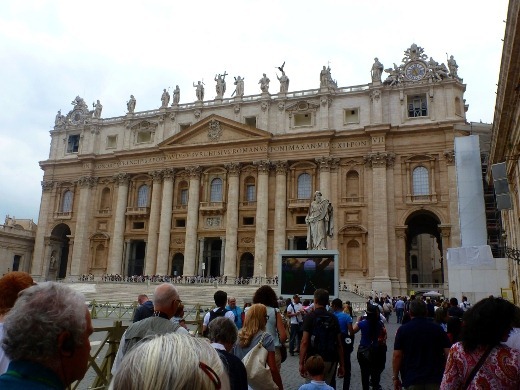 After leaving the Vatican Museums we walked a short distance to St. Peter’s Basilica. 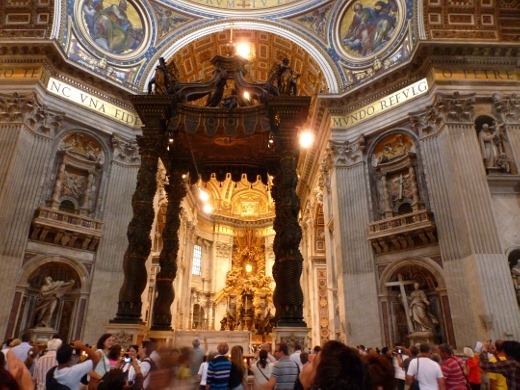 One of the holiest Catholic sites in the world, St. Peter’s Basilica is one of the largest and grandest churches in existence. We waited in the long but fast-moving line for our chance to visit the interior. 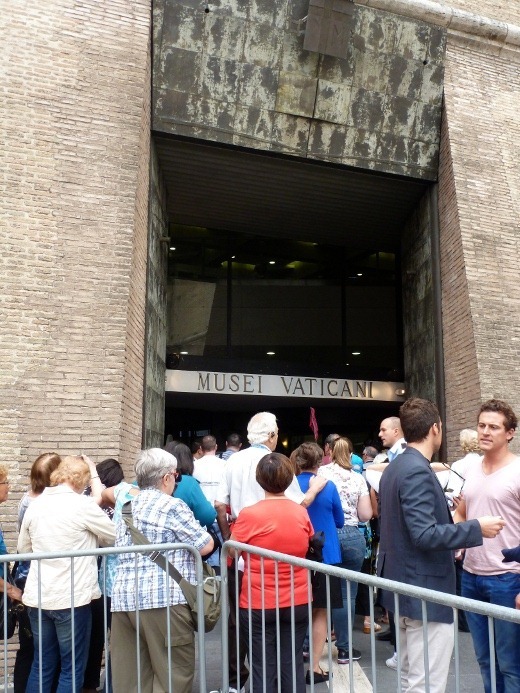 Clips of the Pope speaking (not live) were shown outside while we were in line. Making our way in. My clothing was deemed appropriate and I did not have to wear a paper gown. Great. 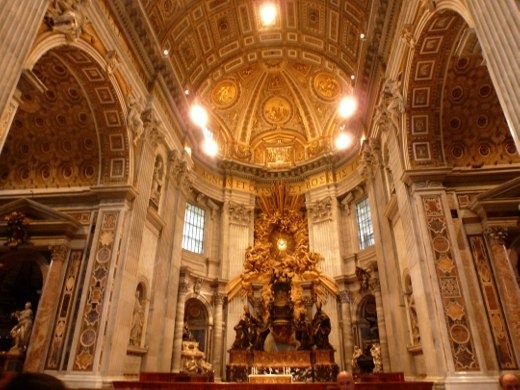 The magnitude of St. Peter’s Basilica, which was completed mostly in the 1500s and 1600s, is mind-blowing. Nothing but grandeur and excess, decorated by some of Italy’s greatest artists: Michelangelo, Raphael, and more. 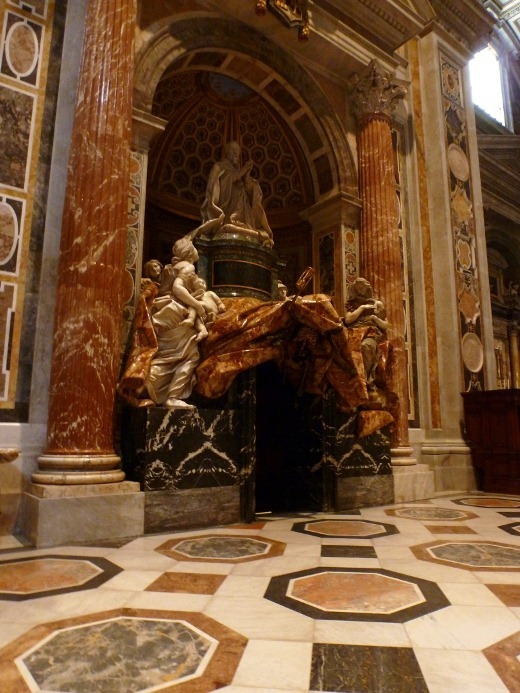 Gilt and marble everywhere. 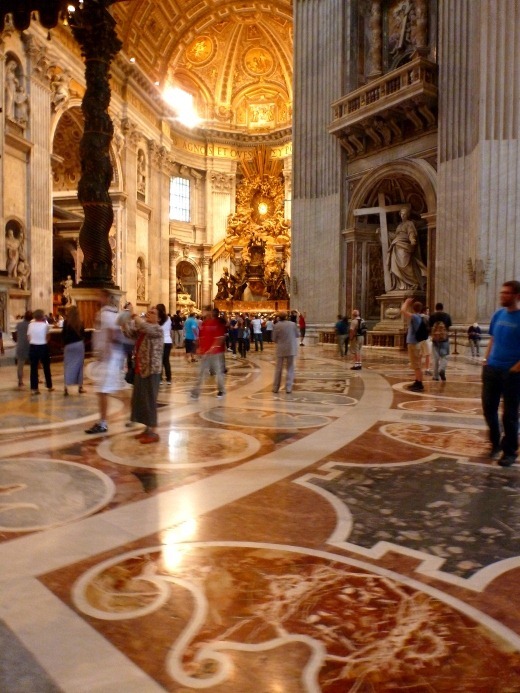 Did I mention how MASSIVE the basilica is!? 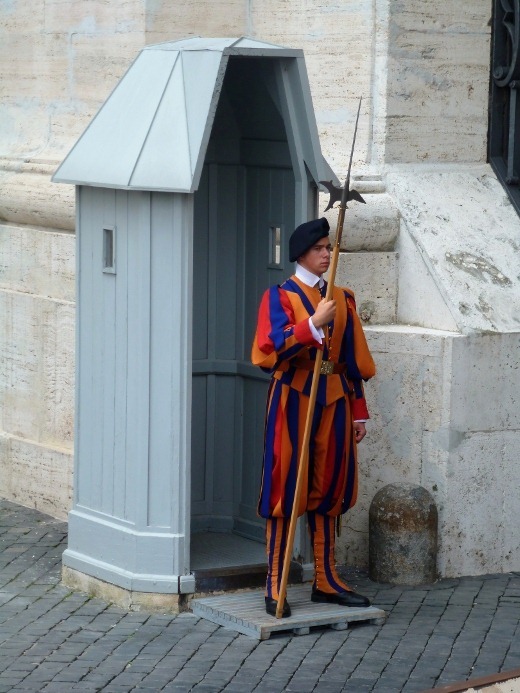 A guard outside the church. Clearly, there is no nonsense allowed here. 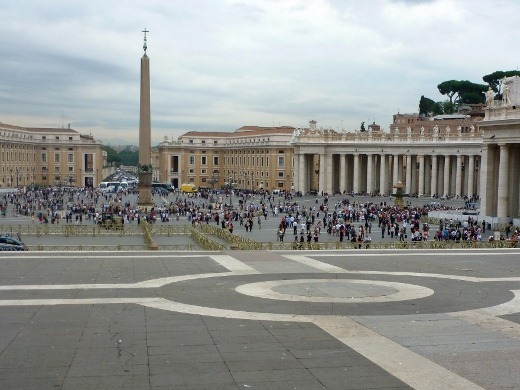 And yet another obelisk stolen from Egypt by the Roman Catholics. 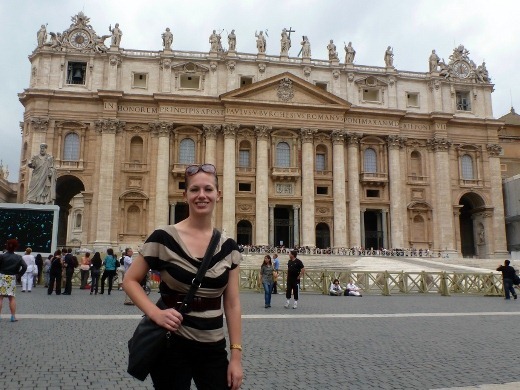 Me in St. Peter’s Square. I was feeling pretty crappy from my illness but tried to be a trooper! Next, we were starving, so we found a nearby restaurant for lunch. 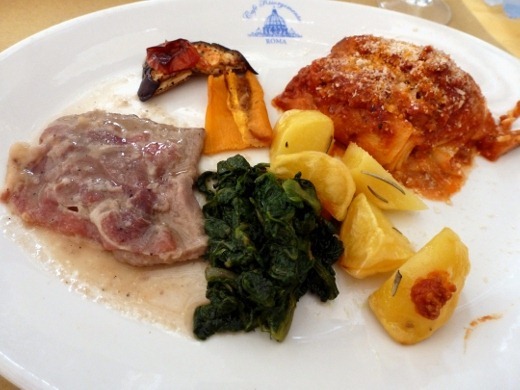 Remember in my last post I mentioned my new-found love for Saltimbocca Alla Romano!? Well, as one might have predicted, this dish was destined to make a few more appearances during our trip, given our new obsession! For lunch, the huz and I both ordered this sampler plate with Saltimbocca Alla Romano, Lasagna, sautéed greens, and roasted veggies. It didn’t quite live up to Mamma Angela’s version the night before (amazing!!) but it was alright. 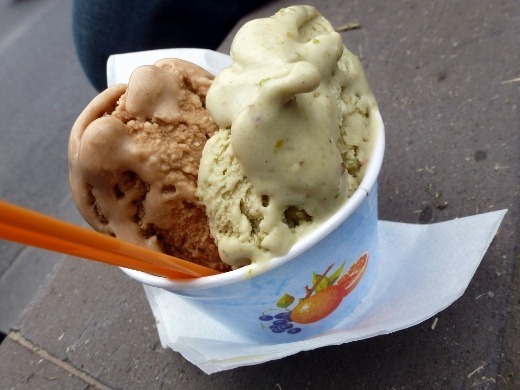 The restaurant also sold gelato, so we both got a to-go cup. I had pistachio and chocolate. 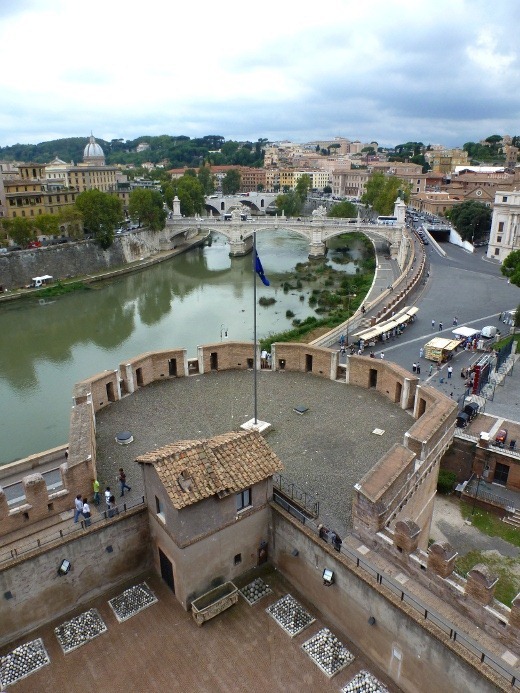 After lunch, we strolled over to Castel Sant’Angelo, which was originally built as a giant castle and fortress for the Emperor and his family in A.D. 135. I love castles so I was pretty geeked out! 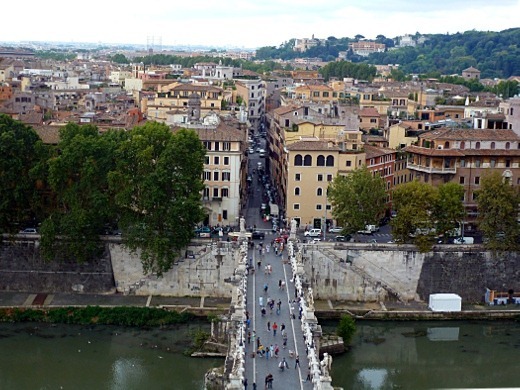 We enjoyed the awesome panoramic views of Rome from the terraces, such as this view of the Tiber River. Visiting this castle was my favorite sight-seeing part of the day actually! It was really neat! Check out that view. 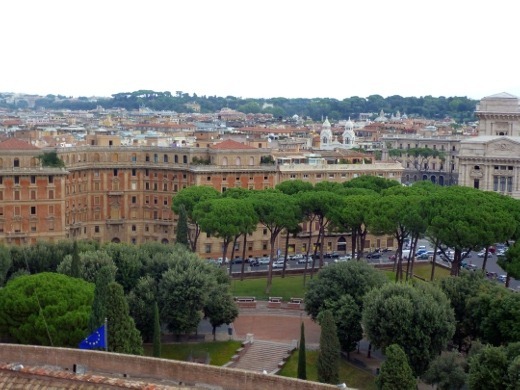 The huz with St. Peter’s Basilica in the background. 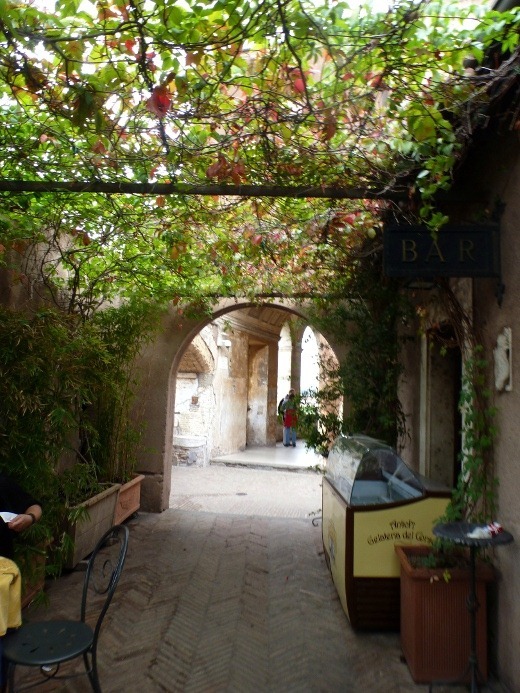 If we’d known that this cute little vine-covered restaurant was located in Castel Sant’Angelo, I think we might have had lunch here instead! How adorable. 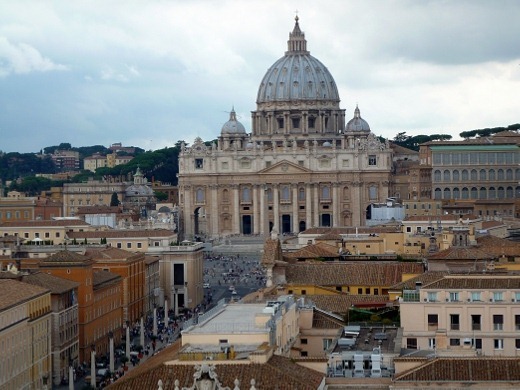 A lovely view of St. Peter’s Basilica. After roaming through the castle, we eventually made our way to the very top. I loved hanging out up here, but eventually it began to sprinkle a bit. 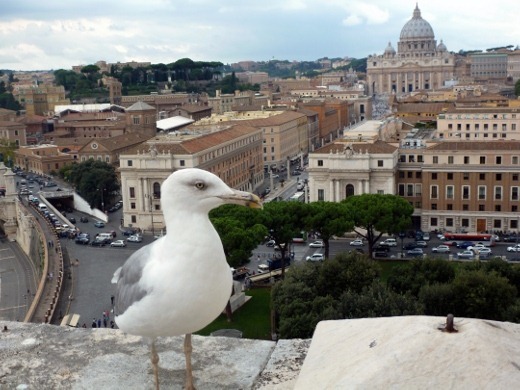 The friendliest and handsomest seagull we’ve ever met resides at Castel Sant’Angelo. Remarkable how he looks JUST like a Michigan seagull too! 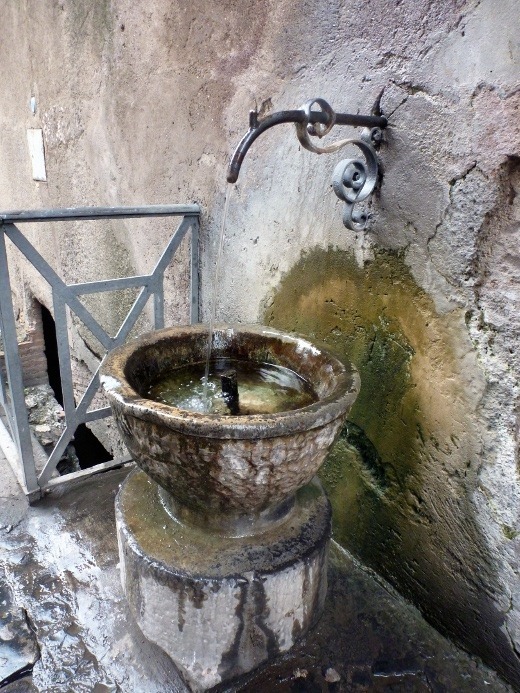 I should also mention how much we loved these free water fountains all over Rome. It was HOT during our visit (mid-80s…and yes, I know, it gets MUCH hotter in August than in September when we were there), so having access to cold, clean water to drink was awesome. When labeled “potable” we would fill our water bottles with these all day to stay hydrated. 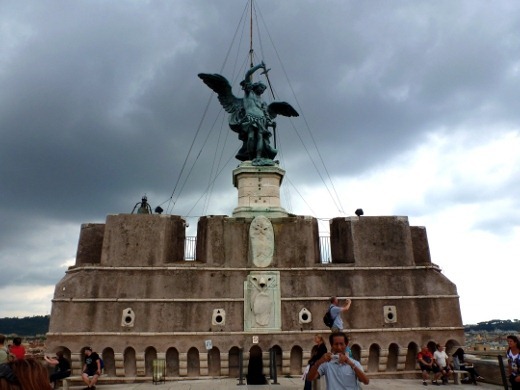 In the misty rain, we walked from Castel Sant’Angelo back to the metro station, where we rode to the Spagna stop to visit the Spanish Steps by day (we visited at night during our first evening in Rome also). 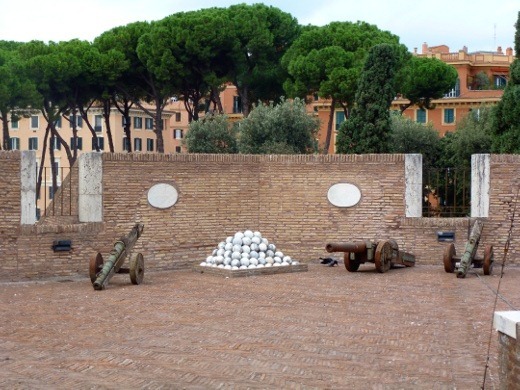 Piazza di Spagna. Love all the energy! 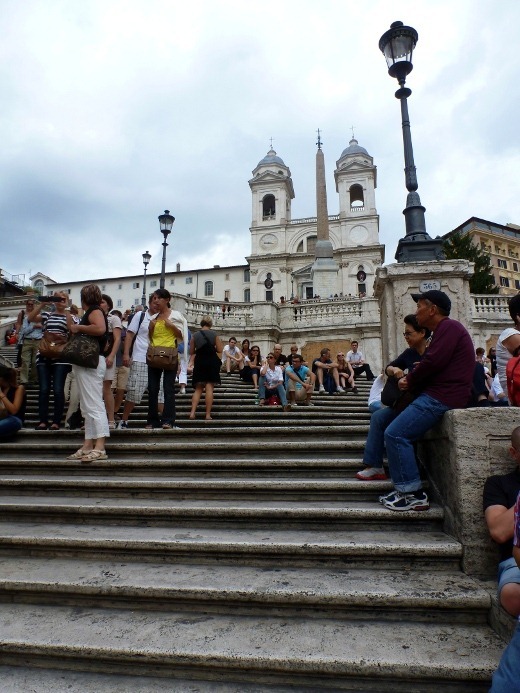 These monumental stairs lead to the Trinita dei Monti Church. 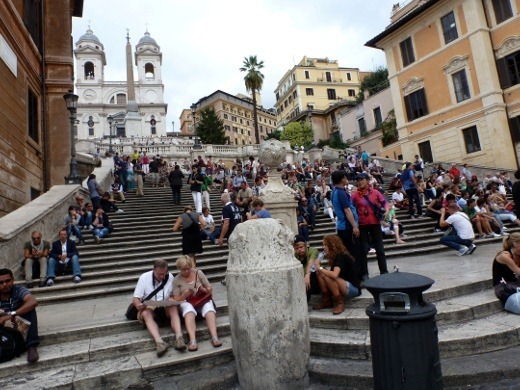 After visiting the Spanish Steps, we rode the metro back to Termini and headed to our hotel for a rest. I was wiped out! Our dinner destination was a Frommer’s Guide recommendation near our hotel in the Termini area, and was called Monte Arci. 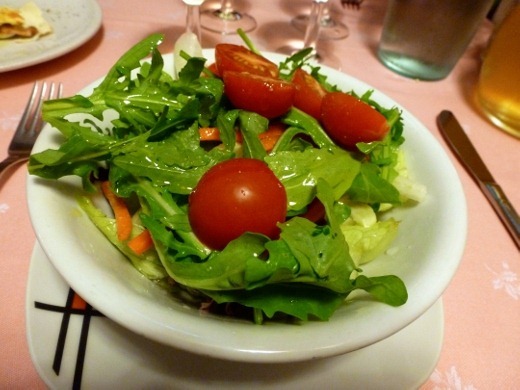 I began with a salad, deliciously – and generously – slathered in olive oil. More arugula though – blast! Still ate that whole thing. Needed those nutrients. 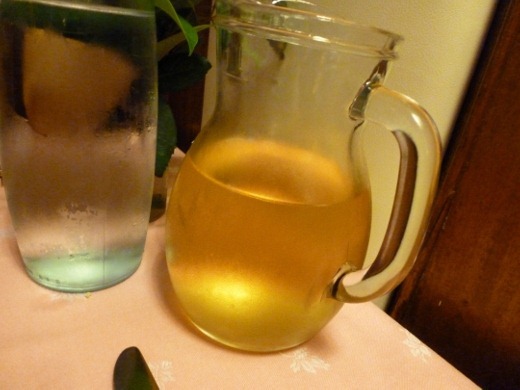 We ordered a local white wine, which came by the LITER! That’s about 1.3 bottles of wine, it was incredibly affordable, and tasted good too. Gosh, I love Italy! Monte Arci was quite the little gem of a find. The vibe was cozy, homey, and warm, and we had a delicious dinner. Our server was really nice too. 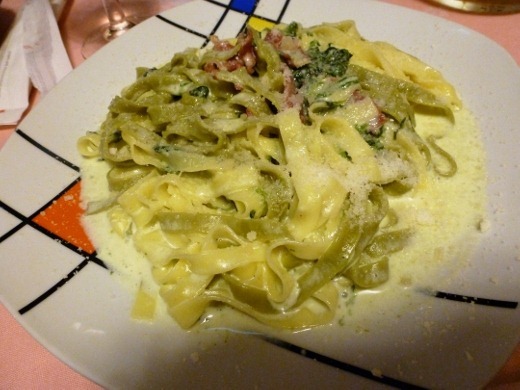 I ordered the dish mentioned in my Frommer’s guide: green and white spaghetti with bacon, spinach, cream, and cheese. Oh yessssss. It was really, REALLY good stuff. Comfort food for the head cold. Luckily I still had my appetite. 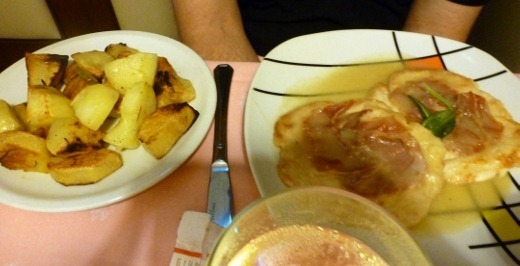 The huz continued the Saltimbocca Alla Romano obsession, with a side of Rosemary Roasted Potatoes. Mmm! 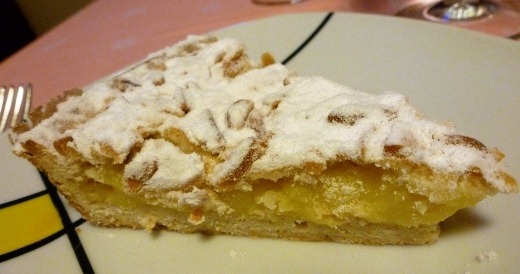 Once we finished our entrees, we decided we wanted more of Monte Arci’s home-cooking and ordered two desserts. We had a feeling the desserts would be good and we were not disappointed. We ordered ‘Granny’s Pie’ (obviously we had to, with that name!) which was a delicious homemade lemony custard. 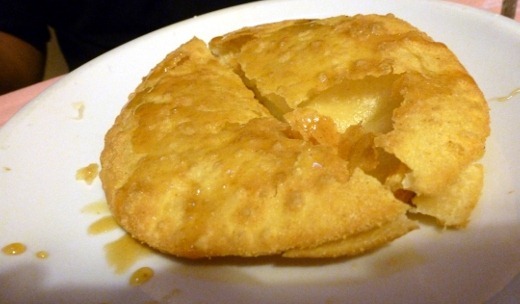 And this honey-drizzled Italian pastry dough. I loved that the middle was just slightly raw because raw dough is one of my very favorite things. We stayed and enjoyed our wine buzz and the warm ambiance at Monte Arci for a while before heading back to our hotel for the evening. 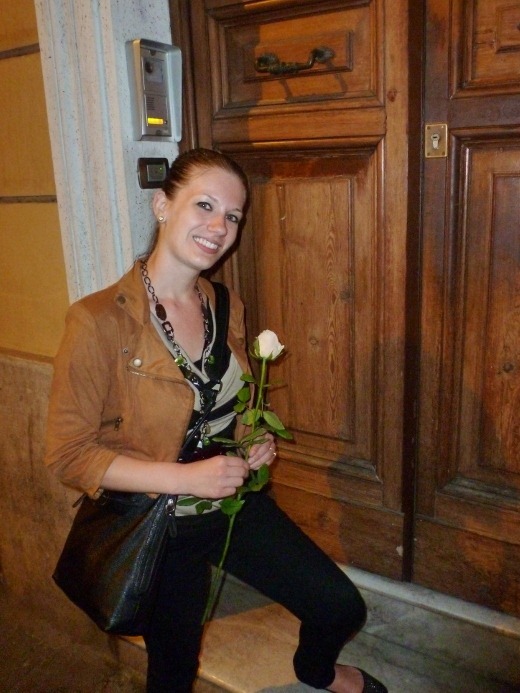 I received a rose from our server at the end of the meal – nice touch! I felt so special!